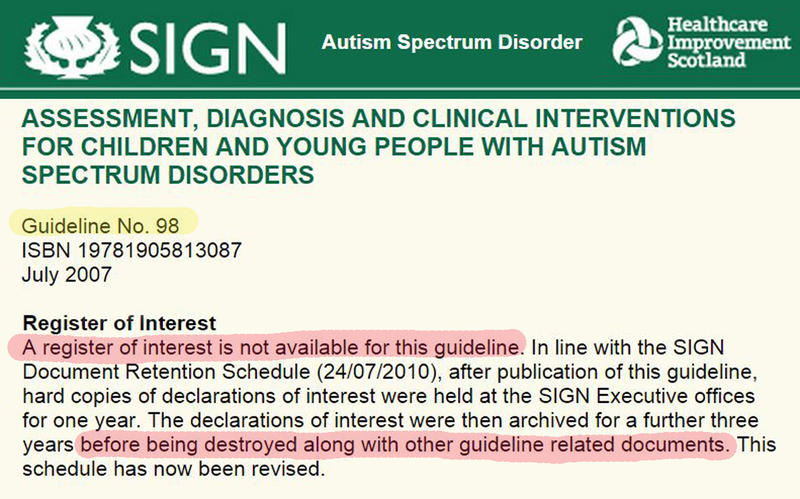 I was recently asked by Autism Rights if SIGN Guideline 98 had records of financial interests for all those involved in developing this national guideline. The answer is no. Along with 38 other separate guidelines, all operational today in NHS Scotland, no records of financial conflicts of interest are available. These were destroyed by SIGN. SIGN guidelines have changed in approach to transparency since I wrote and all newly published guidelines now have declarations of interest included in “supporting material”. I recently re-visited the approach taken by SIGN to transparency. I did so as one NHS Board recently stated in writing that they consider my concern about this as “most unusual”. I started this post with Autism Rights. I would like to conclude with them. In the two articles linked below Fiona Sinclair describes the struggle to make sense of changes in Scottish mental health legislation. Part of this considers the importance of transparency of financial interests in NHS Scotland. My view is that Fiona Sinclair has provided us with important and informed summaries. I have thus urged MSPs, the Mental Welfare Commission, and third-sector organisations to consider the points that are raised within them.